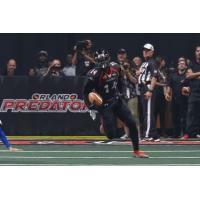 Orlando-Orlando Predators wide receiver Brandon Thompkins has been named the Arena Football League's 2016 Playmaker of the Year, the AFL office announced today. Thompkins brings home the award following a historic campaign in which he garnered First-Team All-Arena honors as both a wide receiver and kickoff returner. Thompkins established a new franchise record and placed third in Arena Football League history by racking up an astounding 3,530 all-purpose yards. He also set a team record for receptions and hauled in at least one touchdown pass in all 16 regular season games. In total, Thompkins finished with year catching 135 passes for 1,631 yards and 38 touchdowns while adding 22 yards with another score on four rushing attempts. Also known for his dynamic ability on special teams, Thompkins was the League's most dangerous kickoff returner in 2016. The sixth-year pro led the AFL with 1,832 yards and five touchdowns on 93 kickoff returns while also adding a 54-yard touchdown on a missed field goal return. Thompkins also earned Second-Team All-Arena honors a kickoff returner in 2015.